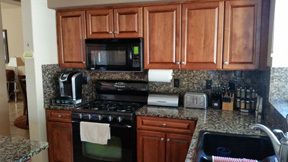 Cabinet refacing is very versatile for dramatically changing the look of your cabinetry. Because the whole face is new, you can change the wood type, door style, and stain or paint color. We can also update the overlay. The overlay is the amount of the face frame that is covered by the door and drawer front. Typically, it will be 1/2 inch, leaving lots of space between the cabinet doors. You can see this difference in the photos below. 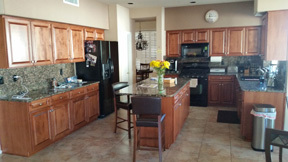 In just a couple days in this kitchen, we got rid of the old oak and whitewash finish, and replaced it with alder in a new stain. What’s not pictured are the new dovetailed drawer boxes with heavy duty soft-close slides. Very nice. 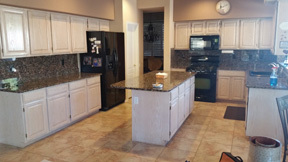 This entry was posted on Monday, December 21st, 2015 at 8:38 pm	and is filed under Refaced Cabinets. You can follow any responses to this entry through the RSS 2.0 feed. You can skip to the end and leave a response. Pinging is currently not allowed.